So over this past year I have become an avid fan of the YouTube series “Don’t Hug Me I’m Scared” (DHMIS). 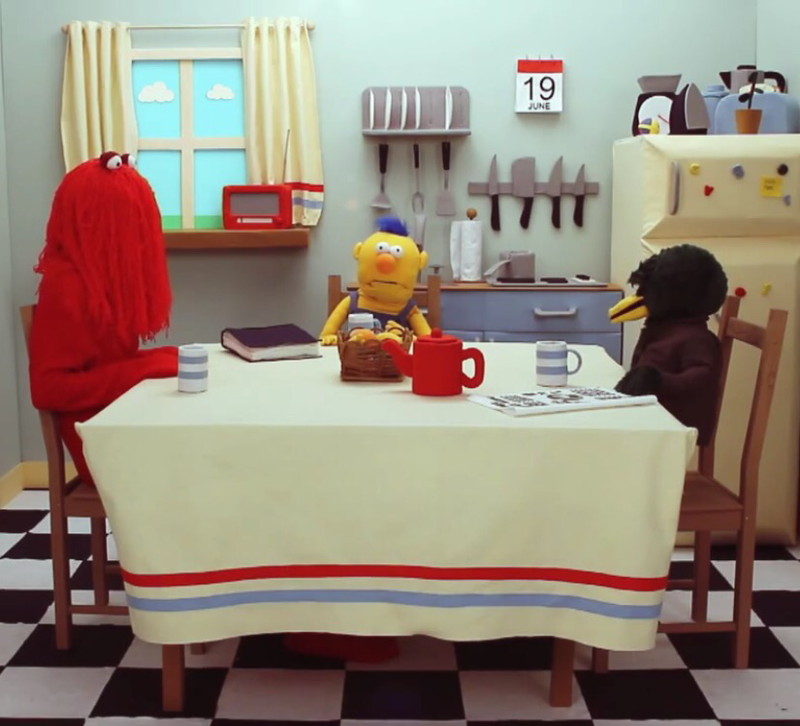 Whether you want to define it as Sesame Street for adults or creepy puppets in everyday situations, DHMIS belongs in the same realm as Happy Tree Friends, Charlie the Unicorn, Salad Fingers, and Llamas with Hats, in the sense that it uses traditionally children’s entertainment mediums (puppetry, cartoons, etc.) to showcase dark and disturbing themes/plot lines. DHMIS, like some of these shows, seems to be innocent and meant for children, but then slowly spirals into dark humor. DHMIS revolves around 3 characters: the yellow puppet with blue hair (“Manny”-these are names fans have given the characters, not the creators themselves), the green duck/bird (“Robin”), and the red yarn creature (“Harry”). The majority of the episodes take place in one of the puppet’s homes where some kind of object or creature teaches the characters about some idea or topic. This is usually via song. Soon the episode drifts from happy to twisted, leaving the characters somewhat mortified at the end. Harry, Manny, and Robin in the pilot episode. 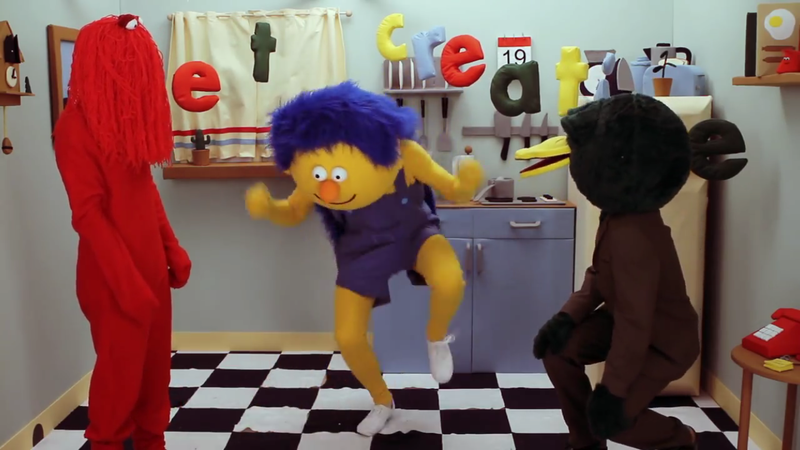 Now, the 5th DHMIS episode came out this past week, and this is by far the most disturbing one I’ve seen. While discussing it with a friend if mine, I noticed something I hadn’t thought of before. All the episodes can be distilled into one or two key themes (1-Creativity, 2-Time, 3-Love/Devotion, 4-Technology, 5-Food/Nutrition), but overall each episode is teaching the characters some things they should or shouldn’t do. I believe that episodes 2-5 may be teaching on the Seven Deadly Sins. First off, episode 2 is focused on a clock admonishing the characters to not waste time. 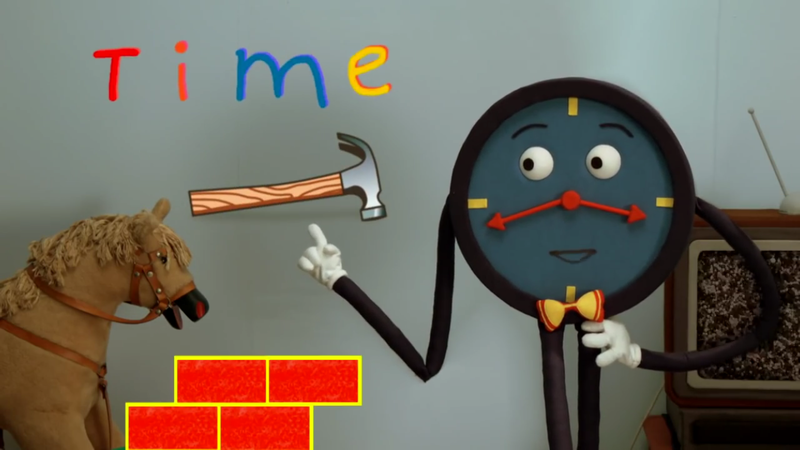 The clock continuously tries to keep the group on topic throughout the video. At the end the characters are told that “Everyone runs out of time” while their bodies decay rapidly. I relate this video to the sin Sloth. Episode 3 is a bit harder to determine in what sin it is on, for it begins with the yellow puppet being upset with hatred/violence. 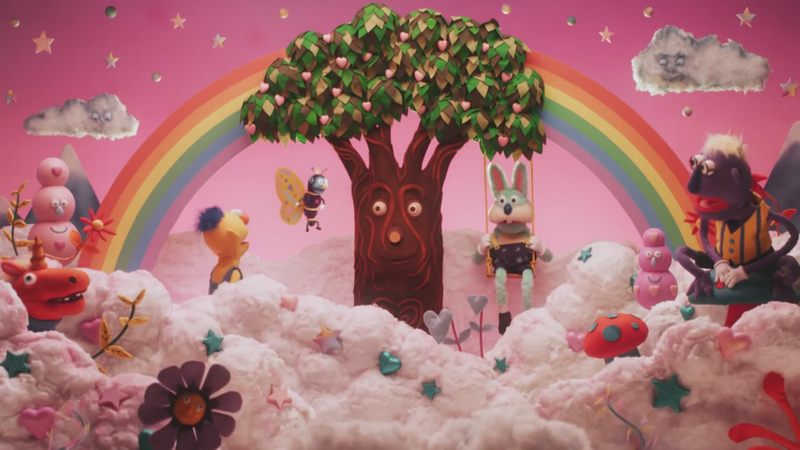 The episode then segues into a song about love and saving oneself for their “special one.” Not to mention there seems to be some kind of religious/cultic undertones, as the group the puppet meets have a king named Malcolm (to whom they feed gravel), and insist that to start anew and get love one must go through some kind of initiation. I think overall the motif is on love and devotion, so I relate this to Lust, as there is a sense of physical/sexual lust as well as a lust for power. Episode 4 begins with a question, “What is the biggest thing in the world?” – which is initially directed towards a globe, but a desktop computer takes over the answer. 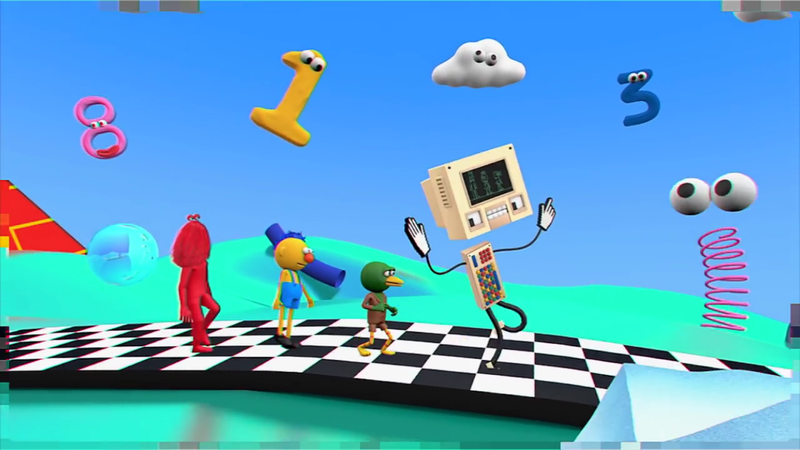 Rather than answering their question, the computer takes the characters to his digital world and distracts them with pie graphs and digital dancing. The computer completely dominates the video. Because of this and the computer’s unwillingness to relinquish control, I relate this video to Pride. I like how there’s just a random spring with googly eyes. The new installment is about food and eating habits. 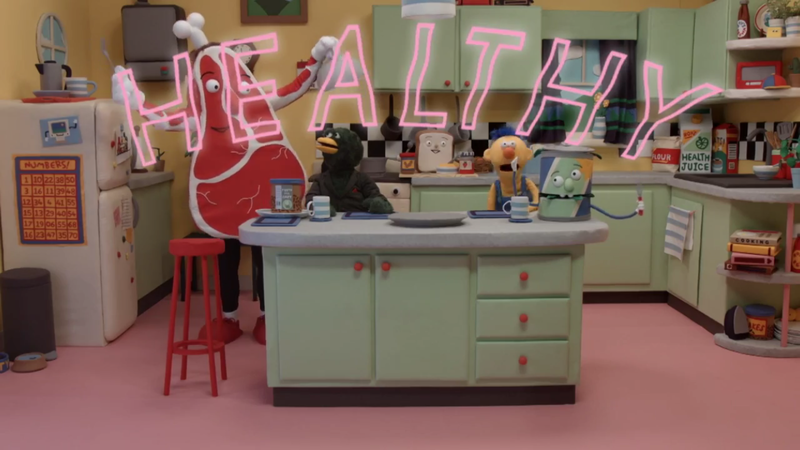 The characters are told to eat certain foods over others and learn how the digestive system works. The video ends in (*spoiler*) a gross display of cannibalism. I obviously associate this with Gluttony. Don’t eat fancy food! You’ll make your teeth go grey! Now, what about the pilot? Why did I not include it in the Sin-list? Well, for one thing, it has a different vibe from the others. It follows the same pattern as the others but it’s not dark from the get-go or doesn’t have interludes of darkness until the end where it goes full-out creepy. Also, the characters aren’t doing anything/have no intent of doing anything at the beginning of the episode, whereas subsequent episodes they are. I see the pilot as almost a proto-sin or perhaps the Original Sin. The three characters are in the kitchen together and out of the blue they’re told to “Get creative!” and to “Listen to the voice[s] inside their head!” The notebook doesn’t really teach them to do/not do anything (in fact, it tells them to “Never be creative again” after they go off the deep end – negating the previous command). In fact, the characters are merely left there to think of what just happened to them. The pilot is the beginning of the creepy, dark struggles the characters are to experience continually in subsequent videos. They have been initiated in this cycle of moral lessons in which they cannot escape from. Get creative and learn some sick moves while you’re at it. This is a fan theory, yes and it is speculative, but I don’t think it’s necessarily wrong to find religious undertones within media. Christianity was/is the undercurrent that has influenced much of Western culture, so even if it is not visible or blatantly stated, its influence can still be felt to a degree. I guess when the next installment comes out we can see if my theory holds weight or not. In the meantime, this is their YouTube channel. Go and watch their videos. They’re fantastic and wonderfully creepy.